The Gandhi Memorial museum at Madurai has been built and organised by the Gandhi Smarak Nidhi. it was in Madurai, in the year 1921, that Gandhiji adopted for the first time the loin cloth as his mode of dress which made him known throughout the world as the "Half Naked Fakir". It was in Madurai again that the doors of the great Meenakshi Temple were thrown open to Harijans, thus winning a historic battle against 'Untouchability'. Gandhiji visited this temple in 1946 along with the Harijans as a triumph for the cause of Harijan Temple Entry. The building that houses the Gandhi Memorial Museum Madurai is the historic Tamukkam Palace of Rani Mangammal of Naick dynasty built about 1670 A.D. 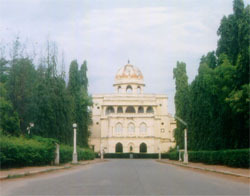 It was in 1955 that the palace with about 13 acres of land was gifted by the Tamilnadu State Government, to the Gandhi Smarak Nidhi for the purpose pf housing Gandhi Memorial Museum. The picture Gallery presents a visual biography of Gandhiji. Special Exhibition on "India" Fights for Freedom" with 265 illustrations, depicting the history of the Freedom Movement, greets you first. Then follows the exhibition of the choice specimens of Handicrafts donated by the states of Tamilnadu, Mysore, Andhra and Kerala. 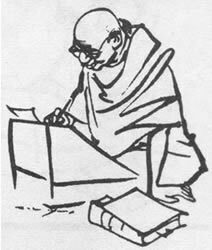 This leads to the Pictorial Gallery depicting a visual biography of Gandhiji by means of photographs, quotations, paintings etc and some of the selected Photostat copies of many of Gandhiji's letters. Then you enter 'The Hall of Relics' where some of Gandhiji's personal belongings (original and replicas) are preserved. Lastly you come to the Khadi and Village Industries Section in the ground floor of the building, where you come across the Exhibits of some of the Village Industries, which Gandhiji revived. In front of the main building, a little towards south, there is "Gandhi Kutir"- a replica of Gandhiji's hut in Sevagram. The northern wing of this building, houses the Library, which contains books giving the cultural background of India, books on and by Gandhiji and allied literature. There are about 20,00 volumes in the library. Photostat copies of about 2,70,000 letters of Gandhiji and 62 reels of Micro-films are the very important and valuable part of the collections in the Library. Five study alcoves have been provided in the first floor of the Library for Research Scholars. Readers forum and Book Review Meetings are held periodically in the Library. A research section is also functioning, books are also published. Aims: To preserve and enshrine Gandhi's message in its original form; to promote the studies, diffusion, research, propagation and understanding of Gandhi's life and message and his ideals of truth and non-violence, To display documents and records relating to Gandhi consisting of his photographs, cine-films, voice records, personal effects, relics and replicas, books and correspondence. Content: Personalia on Mahatma Gandhi- visual biography of Gandhi and relics of Gandhi, Indian Freedom Movement, Khadi and Village Industries Exhibition replica of Gandhi hut, library of 20,000 volumes of books, collections of handicrafts. Special activities: One day educational programme on Gandhian thought, Indian Freedom Movement: short term course for one week on peace science and Gandhian thought; seminars and special meetings. Publications: Biography of Gandhi, Anbu Vazhi Nadantha Annal in Tamil; Indian freedom movement; guide book on Gandhi Museums; Color picture postcards. Timing:- 10.30 h to 14.17.30 h.